The sentence of the National Court on 24 May, which can be appealed, in one of the cases of corruption affecting the People´s Party known has served as the catalyst for upheaval in the government and political map of Spain. The sentence provoked a temporary coalition of various parliamentary groups (from up to twenty parties), which secured a majority of deputies to overthrow the government in seven days, from the presentation of the motion of censure, signed by the socialists, on 25 May to the adoption of the motion seven days later with the support of 180 deputies covering the full spectrum of the left and separatist nationalism. The following day Rajoy left the Moncloa to be replaced by the socialist leader Pedro Sanchez, who 10 days before couldn´t have imagined a substitution so rapid or so brutal. 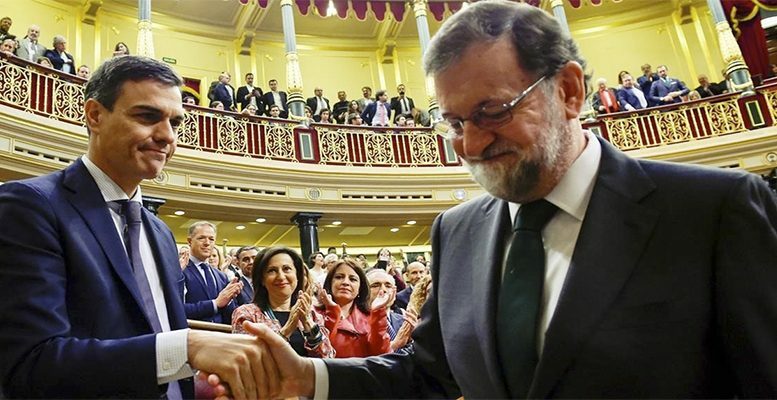 This week Rajoy has announced his resignation as party boss, which will come into effect in a party congress anticipated before the end of July. Sánchez has presented a new monotone socialist government, supported by only 84 deputies, which will have to negotiate in parliament all the initiatives it proposes. The Popular Party, which has governed for the last six and a half years, and which enjoys the largest minority group in the Congress (137 seats out of 350), enters a period of stasis as it reconstructs the centre-right in a scenario of considerable uncertainty about its future. At the same time the unstable socialist party regains political initiative and the appearance of strength with a government formed by experienced politicians and experts, which has earned, at first, favourable opinions. The new government suggest a decidedly pro-European direction (Josep Borrell as Foreign Minister and Nadia Calviño as Economics Minister). The political map has changed radically, although the problems remain: whether the demands for Catalan independence and other nationalist forces that threaten the constitution and national unity, or the urgent need for profound reforms in the welfare system and the management of public accounts, threatened by the deficit and the debt. The upheaval changes the vectors of power and influence, calls into question the leaders of various parties and opens a period of uncertainty and instability. The markets, at the moment, continue focused on events in Italy, without seeing imminent risks in the Spanish case. The speed and depth of the change, which was not foreseen in any futures or risk scenarios, leads one to think that the Spanish system is mature and functions, or, perhaps, the opposite. What starts well ends well.